Our bright and colourful Border Rolls are the display board addition you didn't realise you needed. 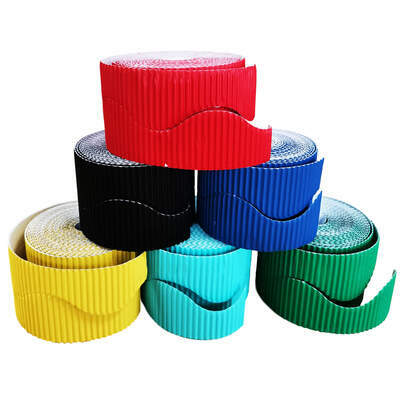 Made from corrugated card and featuring an assortment of bright colours suitable for any display, these rolls are easily stored away for when needed. Each roll features a wavy edging allowing you to decorate your boards however you like. For the more creative teacher, these rolls can also be curved around children's heads to create fun and exciting crowns for dress-up. Easily affixed the wall with traditional glues or pins, these durable border rolls will quickly become a common sight in every room in your nursery or school. Your display boards will surely pop out and capture everyone's attention with our brand new Poster Rolls available online today. Make sure to stock up on everything from Vivid Coloured Card, Glue Sticks and Creative Scissors through to our vivid Cellophane Rolls.